This would have been my first time at Vogue Wedding Show. I had the invite since months, and I had full plans of attending the show. I have never been a designer freak, I knew I would never own a piece…so for me it was all about admiring bridal fashion at its best…checking out what the season trends were, and hoping to say hello to one or two ace designers. But alas, dreams are dreams…and when things are not meant to be, they just find a way of biting you at your worst. We recently moved homes from Delhi and now I am in Gurgaon…and it so happened that I had my shifting on those three crucial days. I mean what are the chances of that happening ! Felt so disheartened…I remember squeaking with joy when the vogue invite by Ravish Kapoor came home. That invite was better looking in some ways than my wedding invite. I just had to say it, no denying that. It was gorgeous…and it just gave me the taste of what the actual show would be like, if the invite is this good. If you missed his entire [new] collection at ICW 2016, may be you should check out that post first. Manish Malhotra has always been a celebrity designer since the beginning, but I love that he is getting into mainstream bridal wedding wear for general public. Yes, its a different thing that nowadays even general public spend lakhs and lakhs of amount of bridal wear, but still good to see that bridge burning between the two. The Vogue Wedding Show was held at Taj Palace, Delhi this year from 5th to 7th August. Around 45+ brands showcased their work over 3 days of true premium wedding extravaganza. The show was an invite only…I remember when I had registered to get an invite, I got a call asking me details about me and my families occupation, car we owned, wedding details, agenda for visiting the show etc etc. It was detailed lets just say that. I found it a bit much…and honestly the whole interrogation made me feel out of place for even wanting to visit the wedding show. But I guess that’s the only way they can truly filter out the crème de la crème. Among the designers showcasing their work were big names like Anita Dongre, Anju Modi, JADE by Monica & Karishma, Manish Malhotra, Monisha Jaising, Ritu Kumar Saniya Maskatiya, Sabyasachi, Shantanu & Nikhil, Tailormade, Tarun Tahiliani Varun Bahl and Vineet Bahl ‘Premiere’. There’s also a special selection of sari labels like Ekaya, Lakshmi, Mangalmayee Jaipur, Myra by Anju Narain and Swati & Sunaina. 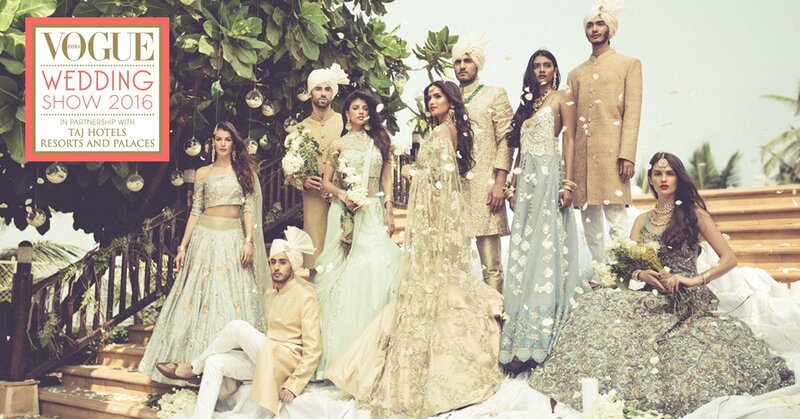 His latest collection ‘Firdaus’ which basically means highest garden in paradise…was showcased at the Vogue Wedding Show. I don’t have the actual pictures from the stall, but here’s what was part of that collection. Take a look. Remember seeing her ‘Epic Love’ collection at ICW 2016? The collection was presented at Vogue Wedding Show 2016 for brides to see first hand and make their bookings accordingly. Her signature gota patti lehengas definitely stand out and you can practically scream Anita Dongre from a km distance when you see one. I’m not complaining. The orange red lehengas were beautiful to look at. No wedding is complete without bridal jewellery and Vogue Wedding Show didn’t disappoint. When you really have a budget to go all out and buy the best of the best wedding wear, its only fair to get the best and the blingiest of the jewellery to accentuate the bridal look. Vogue Wedding Show 2016 showcased the finest selection of bridal gemstones by jewelers including Anmol Jewelers, Amrapali, BN Jewellers, Bharany’s, Birdhichand Ghanshyamdas, Diacolor – Fine Contemporary Jewels, Hazoorilal By Sandeep Narang, Hazoorilal Legacy – South Extension, Khanna Jewellers, Kishandas & Company for Sabyasachi, Mehta & Sons, Raj Mahtani, Rose, Sunita Shekawat Jaipur, Tibarumals Jewellers, Bespoke Vintage Jewels and Gehna Jewellers. With such a spread of companies showcasing their jewellery, I can only imagine what brides must be going through. Its a tough choice to pick the best of the best when everything is top notch. #5 One outfit that stood out in the crowd ! This Manish Arora creation screamed fun and playful. Very Rajasthani in its look, probably a good option for an outdoor mehendi function among marigold decor? What say? What are the charges for attending the show? Entry is free for the wedding exhibition. However, you need to register yourself for attending the show. Once they send you an invite, you can visit the exhibition. Any other things that one should know of before attending? You can check this link on what to expect at Vogue Wedding Show 2017. This should answer all your queries about the wedding show.